The elegance of Windsor furniture always makes an impression! 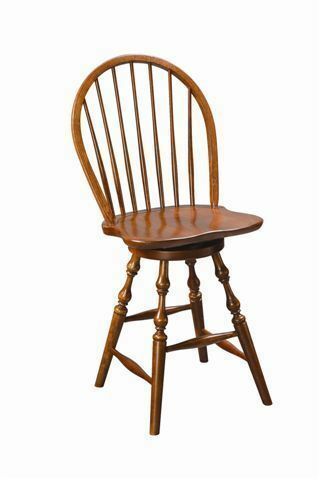 The Amish Alexandria Windsor Swivel Bar Stools wear distinguished Windsor features and are right at home in a traditional style or country style kitchen. The Alexandria Windsor wears its steam bent bow and collection of spindles proudly. There's room to customize these barstools. Choose height, wood, finish and more to create a look you'll love. We can't wait for you to receive your new Windsor stools. Each one is handcrafted and made to order. These stools will last for generations. Please email or call an Amish Furniture Specialist today with any questions about our Amish furniture. You also can stop by our Amish furniture store in Sarasota, Florida to see our furniture in person. We are enjoying our Amish made rocker, bench and bar stools so much! Have a blessed day! We received the bar stools and they are just beautiful! Thanks!